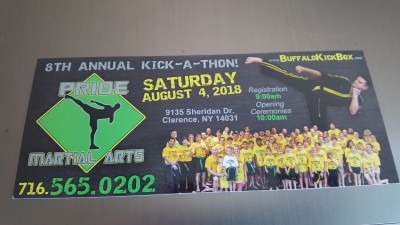 Pride Martial Arts Academy will be hosting its 8th annual Kick-A-Thon to benefit The ALS Association of WNY on August 4, 2018 at 9135 Sheridan Drive, Clarence, NY 14031. Registration will begin at 9:00 AM and opening ceremonies start at 10:00am. In addition to throwing over 70,000 kicks, there will be board breaking, demonstrations, a basket auction, and raffles. This is an open event and anyone can come to watch for free or participate for a $20 registration fee (which includes event t-shirt). Call Pride Martial Arts Academy for details (716) 565-0202. Last year our team raised $9,115.00. Hope to see you there!